There are several means of sharpening your photograph, but I’ll deal with the most commonly used, Unsharp Masking and High Pass. The more commonly used is Unsharp Masking. Easy enough to use, but it has drawbacks as you take it to extremes. Go to Filter/Sharpen where several methods are listed, they are Sharpen, Sharpen Edges, Sharpen More, Smart Sharpen and finally Unsharp Mask. They are all variations of Unsharp Masking, but to do the job yourself click on Unsharp Mask. You’ll be presented with a Panel. It shows Preview, easy to click on and off to see the effect of your sharpening on the whole picture. Amount, from 1% to 500%. Radius, from 0.1 px to nearly 1000px. Threshold, from 0 to 255. Threshold marks the point where action starts, so if 0 is chosen, action by means of the other two parameters starts with the smallest action, otherwise it is delayed till a particular set level is reached. Not the most useful control except for special purposes. Usually it is better to leave it at 0. In the Window where the zoom amount is set at 100%, but adjustable, you can see the effect of moving the Amount slider from left to right, the more to the right the more sharpening is done. Easy to sharpen too much, so use it with care. Radius is the area of Pixels affected in groups. Not easy to explain, but small stars are affected by the Amount slider if a small number is entered in the Radius parameter and large nebulous features will be affected by the Amount slider if a larger number is chosen. So, the general process is to set the Radius, then test the result with the Amount slider. Clicking on the window alternates the window between the original and the result of your sharpening as does clicking on the Preview box. 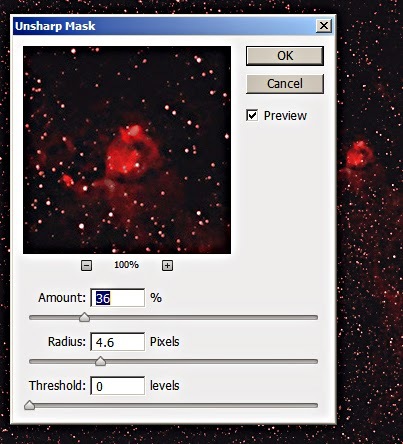 Unsharp Masking has a well known drawback, used to excess it produces black rings round bright stars. As the stars are sharpened and thence brightened, it draws white from around the stars to concentrate it in the star and so denudes a ring around the stars. Panda Eyes is a phrase sometimes used for this. Unfortunately it is easily seen in inexperienced processing work. The oft used alternative, by me anyway, is the High Pass Filter, found under Filter/Other/High Pass. To use it you must first duplicate the current Layer. Click Layer/Duplicate Layer/OK. Or in the Layers List on the right drag the current Layer down to the Create New Layer Icon at the bottom of the list of Layers. Now you have two identical Layers and the upper one is the blue, signifying that it is active. Click on Filter/Other/High Pass, and you’ll see a panel similar to the Unsharp Masking one but with just one control parameter, Radius. However, the small window and the original will show a greyish colour, but you’ll see that as you move the Radius slider, the stars will be highlighted at the lower end of the slider and progressively the larger features will be highlighted as you move the slider to the right. This will indicate the features that this Radius setting will work on. Having decided the Radius you want. Click OK, then click on the Blending Mode and change it to either Soft Light or Overlay and click on the main picture. Soft Light is less harsh than Overlay. Finally Merge the two layers. You can also do it more than once to sharpen small features and then larger features. The High Pass filter doesn’t have the ill effect of black rings round stars unless you do it far to excess. 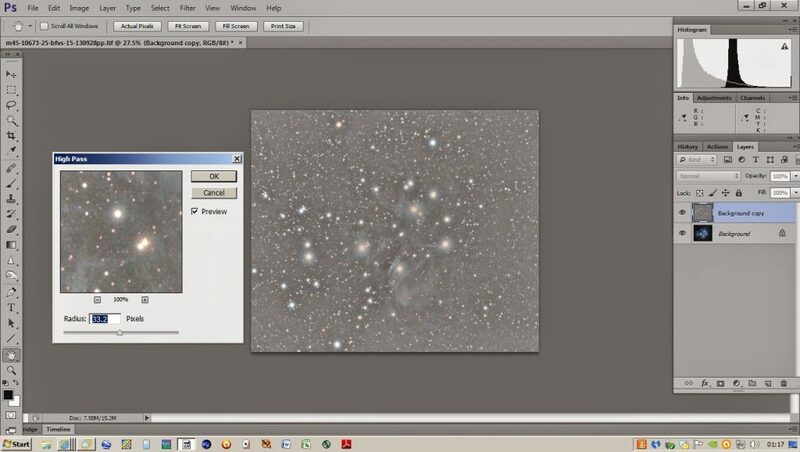 You can see from this, look at the Radius, that it will work mostly on the small features, stars in this image. The rings round the stars at this stage mean that it will work on small features not that it will finally put rings round the stars, it won’t. 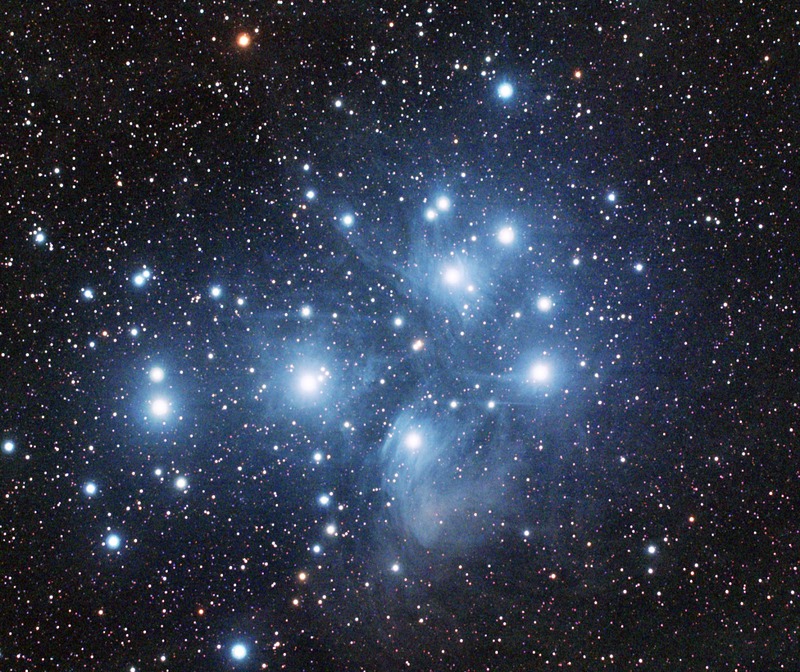 And from this that it will work mostly on larger features, in this photo the streakiness in the nebulosity. This is the photograph before sharpening with High Pass. And this is the result of the High Pass filter actioned with the radius set at 33.2, aimed at sharpening the streaky nebulosity. When doing any sharpening, Unsharp Masking or High Pass there is often a need to review the size of the stars and consider making them smaller. I frequently use this method to gauge the right amount of Radius to use in Unsharp Masking.